Not all sensing solutions require high spatially-resolved imaging. Sometimes a faster-framing system with less spatial resolution is better. Sometimes a non-imaging, or “pseudo-imaging,” system is more effective. 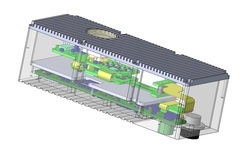 For applications that do not require an image product, SSSC has pioneered simultaneous spectral-temporal sensing, with the capacity to design and develop specialized sensors for our customers’ needs. The CDP is a patented approach for spectral-temporal sensing of point targets. 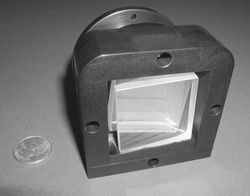 The unique design of the optics allows measurement of the spectral-temporal “signature” of energetic events—like muzzle flash, plumes, or explosions—in hundreds of color bands for a variety of applications. SSSC cueing sensors are Wide Field of View (WFOV) sensors that can detect and classify targets or anomalies as part of an integrated system. Examples of custom cueing applications include: cueing a long focal-length camera for ISR applications, cueing a high spatial-resolution camera for situational awareness, and cueing a fine-track sensor for targeting or countermeasures.